The Wyandot, or Wendat, also known as Huron, are indigenous people, originally living along the St. Lawrence River and between Lake Huron and Lake Ontario in what is now Southern Ontario and Quebec in Canada, and Southeast Michigan in the United States. However due to Indian removal in the nineteenth century, today around 4,500 Wyandot now live in Kansas. Although successful in many ways, the Huron both historically and today have experienced much internal division and conflict among the different groups that made up their confederacy as a whole. Although they had light canoes that allowed them to travel far and so establish successful trading relationships with other tribes and the colonial French, they were almost completely wiped out in attacks by the neighboring Iroquois. Today, the remaining Wyandot are making efforts to revive their culture and identity, although disputes between the different groups continue. The Wyandot are culturally identified as an Iroquoian group, and were a confederacy of four tribes. 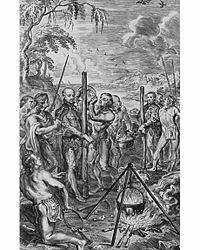 Early French explorers called them the Huron, either from the French huron (peasant), or, according to Jesuit Father Gabriel Lallemant, from hure, the rough-haired head of wild boars. The Wyandot homelands, near Georgian Bay, were known as Wendake. The approximately 3,500 Wyandot in Quebec are primarily Catholic and speak French as a first language. There are now efforts to promote the use and study of the Wyandot language. For many decades, a leading source of income for the Wyandot of Quebec has been selling pottery and other locally produced crafts. Early written accounts of the Huron were made by the French, particularly Jesuits such as Armand de La Richardie, who learned the Wendat language and examined their social organization. Tuberculosis was endemic among the Wyandot, aggravated by the close and smoky living conditions. From 1634 to 1640, the Huron were devastated by European diseases such as measles and smallpox, and numerous villages and areas were permanently abandoned. The population decreased from 35,000 to 12,000. The establishment of the French Jesuit mission at Sainte-Marie among the Hurons in 1639 led to division, with conflict between those who converted to Christianity and those who maintained their traditional beliefs. Disease, an unintended result of first contact between the Jesuits, served to further the gap between the traditional Huron and the missionaries. Also during this time, the rivalry between the Huron and their Iroquois neighbors began to reignite, and the Huron were weakened by their internal divisions and their losses from the conflict. Before the French arrived, the Huron had already been in conflict with the Iroquois to the south. Once the European powers became involved, this conflict intensified significantly. The French allied with the Huron, because they were the most advanced trading nation at the time. The Iroquois tended to ally with the English, who took advantage of their hatred of the Huron and their new French allies. The introduction of European weapons increased the severity of wars, and, by about 1650, the Iroquois had almost completely destroyed the Huron tribes. The Jesuit mission of Sainte-Marie among the Hurons, near modern Midland, Ontario, was one focus of Iroquois attacks, and many of the Jesuit missionaries were killed; the mission was eventually dismantled by the settlers so as to prevent capture in 1648. After a bitter winter on Christian Island, Ontario, some Huron relocated near Quebec City and settled at Wendake, Quebec. By 1701 they had moved to the Ohio Valley between present-day Detroit and Cleveland where they were known as the Wyandot. They remained there until they were removed to Kansas during the 1840s. Only one group of Wyandot managed to remain in the Great Lakes region, when a small band of the Canadian Wyandot in southwest Ontario was given a reserve near Amherstburg. For the Wyandot who relocated to Kansas, problems began with the passage of the Kansas-Nebraska Act (1854) which opened their lands to white settlement. The majority opted for citizenship and allotment and they currently have state recognition as the Wyandot of Kansas. Most still live in the vicinity of Kansas City, Kansas. The more traditional Wyandot left Kansas for northeast Oklahoma after the Civil War to become the Wyandotte Tribe of Oklahoma. The Wyandot were divided into various "nations," comprising the Huron Confederacy. There were four to six nations, including the Arendarhonon, Tahontaenrat, Attigneenongnahac, and Attignawantan (that apparently included the Ataronchronon). This confederacy was similar to that of other Iroquoian peoples in the area: the Petun nation around Georgian Bay in southern-central Ontario was divided into Bear, Cord, Deer, and Rock tribes; the Attiwandaronk or Neutral Indians on southern Lake Huron and northern Lake Erie were organized similarly to the Iroquois, who were a league of five (later six) nations. Each of the Huron villages managed its own affairs internally, by tribal council, governed by village elders and generally a head chieftain. Varying in size and shape, the larger villages were generally fortified well to protect against an enemy attack, and they had populations up to and over 1,000. The Wyandot lived in villages spanning from one to ten acres (40,000 m²). They practiced agriculture and lived in long houses similar to other Iroquoian cultural groups. The typical village had 900 to 1600 people organized into 30 or 40 longhouses. Villages were abandoned every few decades as the nearby forest grew thin and the soil became less fertile. Wyandot practiced a loose monogamous marriage that could be ended by divorce by either party at any time and did not confer any degree of sexual exclusivity. Sexual restraints were few and far between, and attractive, young Wyandot women could accumulate considerable wealth bartering sexual favors. Unlike the Iroquois, the Huron women did not own all material property. Instead, the farmland was owned by the matrilineal clans. Unique to the Huron was the traditional "Feast of the Dead," held every ten to twelve years, during which the remains of all who had died since the last ceremony were exhumed and re-buried in a communal burial pit. It was believed that only then were their souls able to go to the "land beyond where the sun sets," to find peace among the happy hunting grounds of their ancestors before them. 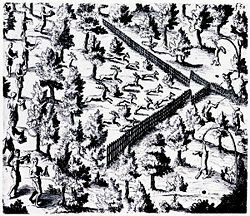 Sketch by Samuel de Champlain of a Huron deer hunt using a large V trap. Deer driven through forest to the point of a V where hunters wait. The Wyandot maintained stores and provisions, and were comparatively wealthy. They engaged in extensive trade with neighboring tribes, and even with tribes from as far south as the lower Mississippi. They traded for tobacco with the neighboring Tionontati nation and Attiwandaron. The Attiwandaron were also called the Neutral Indians because they remained neutral in the conflict between the Wyandot and other Iroquois. This tobacco they then traded to the Anishinaabe nations to their north and to the French. They forcibly prevented the Neutrals from establishing direct trade with the French, and so commanded huge profits as middlemen. The transportation aspect of the trade industry of the Huron people was very appealing to the French. The fur trade was supported by the Jesuit missionaries and endured beyond feudal wars. After the Huron mostly disappeared in 1649, small bands survived to become the Wyandot. Despite a defeat at the hands of the French in 1793, the Wyandot continued to command great respect throughout the Great Lakes region. Huron justice was often brutal and unrelenting. Convicted murderers were often tied to their victim's corpse and allowed to starve to death. Eventually, violent offenders were shot by firing squad. The Wyandot were animists who believed spirits were present in just about everything, animate or inanimate. They had a number of rituals, including the torture of captives, relating to the worship of a sun deity. They were reported as holding an annual ceremony in which two young girls of the tribe would wed the tribe's fishing nets, in the hopes that this would encourage the nets to perform their tasks more effectively. Like their Iroquois neighbors, the Huron cultivated a number of crops for food, including corn, beans, and sunflowers. They supplemented their diet by hunting and fishing, and gathering wild plants. The Huron hunted deer, often by driving them into rivers or fenced-in areas, using bows and arrows to kill them. One critical difference between the Iroquois and Huron was their birchbark canoe. Iroquois used Elmwood to construct their vessels, making them extremely heavy, and as a result, they usually preferred to travel by land, but the Huron people who were surrounded by a network of rivers and lakes, used their canoes to travel great distances, trading their agricultural goods with other tribes, including the Iroquois, and the French. Sainte-Marie Among the Hurons (French: Sainte-Marie-au-pays-des-Hurons) was a French Jesuit settlement in Wendake, the land of the Wyandot, near modern Midland, Ontario, from 1639 to 1649. It was the first non-aboriginal settlement in what is now the province of Ontario. Established in 1639, the mission acted as a center and base of operations for Jesuit missionaries in the region as they worked amongst the Huron. It also provided an example of a functioning European community to the Huron. The mission was built near the Huron settlement of Quieunonascaranas, led by chief Auoindaon. The mission was initially founded by 18 men. Arriving in November 1639, they erected a makeshift shelter out of cypress pillars and a birch bark roof, using clay to build in the interior walls. After the arrival of carpenter Charles Boivin, further construction resulted in a chapel, a residence for the Jesuits, a cookhouse, a smithy, and other buildings. The Jesuits preached the Christian Gospel to the Huron, often adapting the story to more familiar local customs. One of the most famous examples of this was the "Huron Carol," a Christmas hymn, a fictionalized version—using neither the original word nor tune—of which remains popular in Canadian churches to this day. Eight of the missionaries—Saint Jean de Brébeuf (1649), Saint Noël Chabanel (1649), Saint Antoine Daniel (1648), Charles Garnier (1649), Saint René Goupil (1642), Saint Isaac Jogues (1646), Saint Jean de Lalande (1646), and Saint Gabriel Lallemant (1649)—were martyred in the Huron-Iroquois wars. Owing to the proximity of their deaths to Sainte-Marie, the bodies of Brébeuf and Lalemant were quickly recovered by the French and buried at the mission. The eight martyred missionaries were canonized by Pope Pius XI in 1930, and are collectively known in Canada as the Canadian Martyrs. The site, adjacent to the Martyrs' Shrine, was visited by Pope John Paul II in 1984 as part of his papal visit to Canada. we ourselves set fire to it, and beheld burn before our eyes and in less than one hour, our work of nine or ten years. The site of Sainte-Marie lay dormant until 1844, when Jesuit Father Pierre Chazelle conducted initial site excavations. Father Félix Martin continued this in 1855, and in 1940 the Society of Jesus purchased the property where Sainte-Marie stood. In 1941, Kenneth Kidd of the Royal Ontario Museum undertook the first scientific excavations of the site. Wilfrid and Elsie Jury of the University of Western Ontario undertook additional excavations, and in 1954 the graves of Brébeuf and Lalemant were discovered by Father Dennis Hegarty. Sainte-Marie has been rebuilt as a historical site and living museum. All of the buildings and all the contents are reproductions. It is a popular tourist attraction, drawing thousands of visitors each week during the summer months. The site is managed by Huronia Historical Parks. In February 1985 the U.S. government agreed to pay descendants of the Wyandot Indians $5.5 million. The decision settled a 143-year-old treaty which forced the tribe to sell their Ohio homes for less than fair value in 1842. A spokesman for the Bureau of Indian Affairs said that the government would pay $1,600 each, in July 1985, to 3,600 people in Kansas and Oklahoma who could prove they are Wyandot descendants. A program founded in the 1940s to address grievances filed by various Native American tribes allocated $800 million to rectify promises broken by settlers who invaded their territories. The Wyandot settlement was based on an 1830 Federal law which required Native Americans to move west of the Mississippi River. Originally the Wyandots were paid 75 cents per acre for land that was worth $1.50 an acre. In 1999, representatives the far-flung Wyandot bands of Quebec, Kansas, Oklahoma, and Michigan gathered at their historic homeland in Midland, Ontario, and formally re-established the Wendat Confederacy. The historian Georges Sioui is a Wyandot from a family active in the local politics of Wendake. Bruce Trigger was a noted scholar in Wyandot studies; in honor of his work, he was adopted as an honorary Wyandot. The Kansas and Oklahoma groups have fought legal battles over the Huron Indian Cemetery in Kansas City, Kansas for over 100 years, and this continued into the twenty-first century. The local Wyandots wish to preserve the 400-plus grave cemetery, while the Wyandotte Nation of Oklahoma wants to use the land to establish commercial gambling. ↑ P. C. Hartney, "Tuberculois lesions in a prehistoric population sample from southern Ontario" (1981). in Jane F. Buikstra, (ed.) Prehistoric Tuberculosis in the Americas (Evanston, IL: Northwestern University, OCLC 7197014). ↑ Gary Warrick, "European Infectious Disease and Depopulation of the Wendat-Tionontate (Huron-Petun)," World Archaeology 35(2)(October 2003), 258-275. ↑ "Wyandot Indians Win $5.5 Million Settlement," New York Times (February 11, 1985): A10. Seeman, Erik R. The Feast of the Dead berfrois. August 2, 2011. Retrieved August 10, 2011. Wyandot Government: A Short Study of Tribal Society by John Wesley Powell. This page was last modified on 20 January 2018, at 16:40.